Once thought to bring good luck, fidelity, and wisdom, sapphires are a popular choice for engagement rings. Before you select this beautiful gem for your special ring, take some time to learn about its deeper meaning and historical significance. According to the International Gem Society, sapphires have long been associated with a number of positive attributes, which may have led to their popularity as an engagement ring gem. The Ancient Greeks wore sapphires as a symbol of deep wisdom and the god Apollo. Their deep blue hue was also thought to call up the planet Venus, and some felt they could influence spirits with the help of the gem. Ancient Greeks and Romans felt the sapphire had protective properties, guarding the wearer against envy and misfortune and bringing good luck. In the middle ages, people sometimes believed a sapphire would turn a different color if the wearer of the gem was unfaithful. 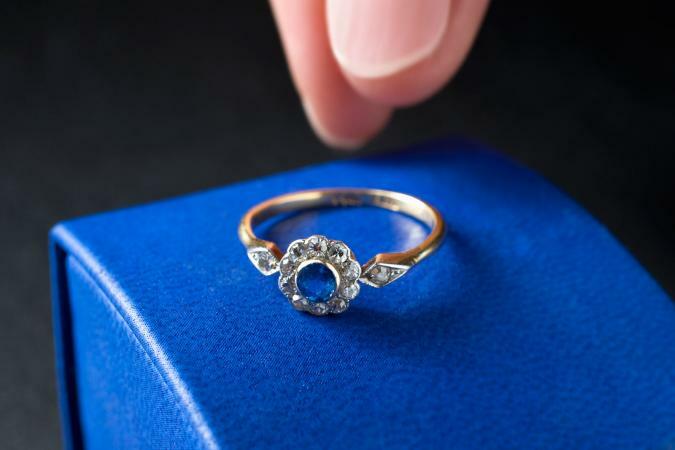 An 18th century folk story, "Le Sapphire Merviellence," created even more support for this idea and likely led directly to the popularity of sapphire engagement rings. In the Victorian era, the sapphire became even more popular, including its use in symbolic message engagement jewelry, where it stood for "S" in gem messages like "DEAREST" (diamond, emerald, amethyst, ruby, emerald, sapphire, topaz). Today, sapphires are still a popular choice for engagement jewelry. Some couples just love the color and look of this gem, but others choose sapphires for their symbolism as well. September - Sapphire is the birthstone for September, so it can symbolize a bride's birth month or the month that a couple met or became engaged. Royalty - Still a popular choice with royalty, such as Princess Kate Middleton, the sapphire remains associated with royalty and sophistication. Uniqueness - In an era where diamonds are still the traditional choice for engagement rings, sapphire offers the chance to make a statement about the one-of-a-kind nature of your love. Whether you love sapphire for its historical significance, modern associations, or just because it's beautiful, this durable and lovely gem makes a great choice for your engagement ring. Knowing the symbolism behind it will make it even more special.